Access BannerWeb from Middlebury Home Page: www.middlebury.edu, by selecting BannerWeb from the “Quick Links” in the bottom menu bar. Or, enter the URL: go.middlebury.edu/bw. Then enter the Secure Area. You will be prompted for your User ID and PIN to enter the secure area. You will also be asked to create a reminder question and answer to be used in the future should you forget your PIN. This way, you can reset your PIN yourself if you forget. Once you click “Submit”, you will enter the secured area where you will have access to your Faculty information as well as your Personal and Employee information. For this reason, please keep your User ID and PIN confidential! Select the Faculty and Advising link or use the Faculty Services Tab. To Access your Class Rosters, you will need to pick the term and the course section. You can select the term you plan to work in at the beginning of your session, or the system will ask you which term when you choose other options within your BannerWeb-Faculty Services menu. Middlebury Faculty will choose Terms that do not end in “- MIIS”. Faculty from the Institute will use the terms ending in “-MIIS”. When you click on the Class List or Wait List links, you will be asked to select the course section/course reference number (CRN) of the course roster you wish to access. Only the courses for which you are assigned will be available in the drop down menu box for you to pick from. Summary Class List – Student’s names and ID#’s, among other things. The Detailed Class List provides similar course information along with the student’s program of study, Commons, and registration class standing. The Registration Number depicts the order in which the students in the class registered. Creates a convenient spreadsheet of students enrolled in your course for you to modify as needed. Enter the 5 digit Course Reference Number (CRN) of the course you wish to view, or find the course by entering its subject code and number, and click on the Get Roster button. To export your list to an Excel Spread Sheet, click on DOWNLOAD CLASS ROSTER. 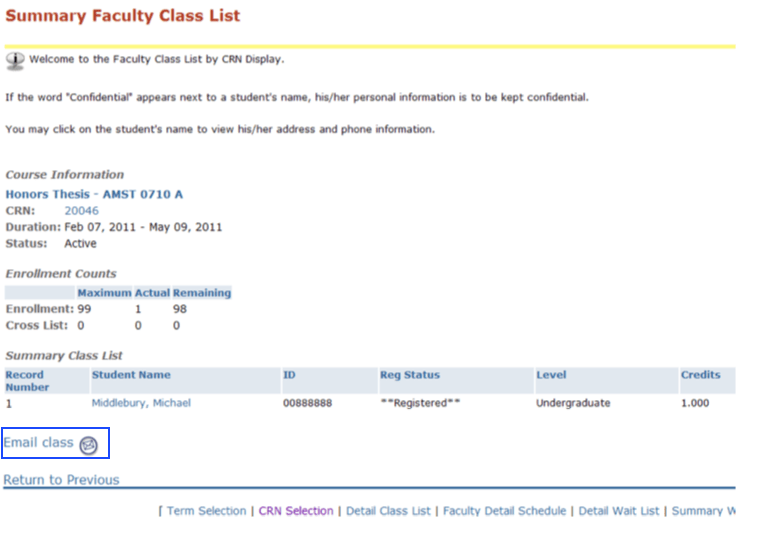 You may use the summary class list to access an e-mail list of your class. Click the “Email Class” link on the class list page to initiate an e-mail message with the class. Select the Faculty and Advising menu or use the Faculty Services Tab. Click the “Grade Roster for ALL Students” link. Select a final grade for each student from the pull-down list in the Grade column – no blanks please! Choose “Submit” when you have selected a grade for every student. You may edit submitted grades until the grade entry deadlines. Use the “CRN Selection” link at the very bottom of the page to choose your next course. OR, click on the “Course Reference Number” link from the Main Faculty Services Menu, select a new course to grade, and then pick the Grade Roster link when you return to the Main Menu. Notify registrar if a student is attending, but does not appear on your course roster. Audit grades will appear but cannot be changed here. Save your grade entries as you go as there is a 30 minute time-out. You may edit submitted grades until the grade entry deadlines. If you are going through the faculty technology orientation, see below to get back to any of the modules.